As of 29 September, the EU-wide legislation on the electronic identification (eIDAS Regulation) will enter into force enabling cross-border recognition of the electronic ID and allowing citizens and business to share their identity data when necessary. People will be able to use their electronic ID (eID) such as ID cards, driver licenses, bank cards and fill tax returns online, access medical records and online public services across the EU. Europe needs to speed up on eID. Using eIDs increases trust and cuts cost. Now only people and companies from two countries can access and use online services everywhere in Europe. The sooner the remaining EU countries notify their eID schemes, the quicker it will help all Europeans. I would like to see SMEs in particular make more use of eID and electronic signatures, to protect and improve their activities across Europe. Cross-border electronic transactions, such as enrolment in a foreign university, opening a bank account, accessing electronic health records. Citizens moving to another European country will be able to manage administrative work online, cutting out the paperwork. Opening a bank account anywhere in the EU without being physically present in full compliance with the EU rules, especially against the money laundering. To make progresses in this area Commission will be assisted by an Expert Group on eID & Know Your Customer (KYC) that was set up earlier this year. Reinforce the rules of the General Data Protection Regulation.Trusted eIDs could be used for age verification as a prior step to access social media or to protect minors when going online without disclosing the identity of the user or any other information. Sharing only the necessary information, thus reducing significantly the risks of data misuse and scandals like the Cambridge Analytica. This parameter is essential in the development of Blockchain systems where ownership and accountability are the key factors. Reduce costs by using eID and electronic signatures. The Commission has recently launched a special website to raise awareness and assist SMEs in this area. 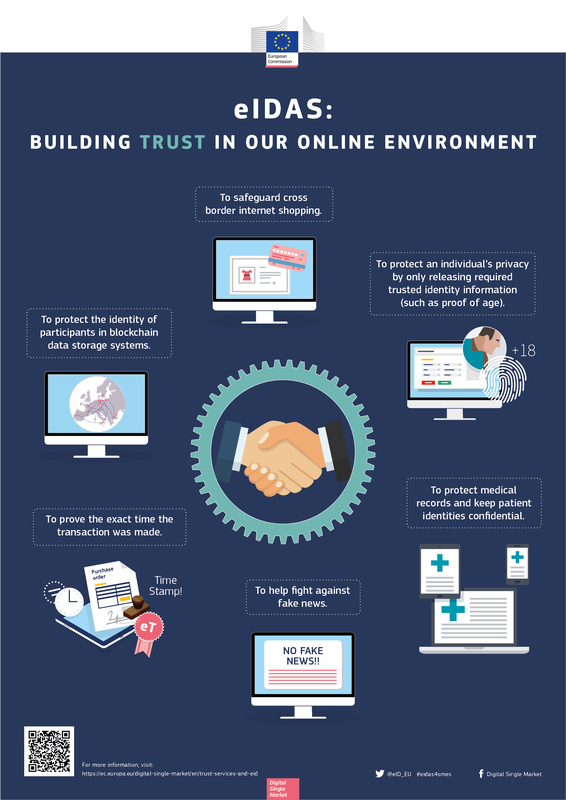 With the entering into force of the eIDAS regulation, Europe makes another step towards ensuring a safer online environment. To increase citizens' trust, public authorities are not the only ones to play an active role. It is important that also the private sector benefits from eIDAS' full potential, as this legislation holds the power to create a market for authentication, authorisation and attributed services worth more than 2.13 billion EUR by 2022. Using electronic IDs will save for business more than 11 billion per year. Today, 58% of EU citizens choose to get in touch with the public administrations online and not to go to their offices with papers. The online availability of public services in Europe is reaching 82%. To be able to use eID Member States first must notify their national electronic identification means to the European Commission, so that they can pass a peer-review in order to qualify for mutual recognition. Germany and Italy are the two EU countries that have completed their notification procedure. Croatia, Estonia, Luxembourg and Spain have completed, it remains to be published in the Official Journal of the EU which is expected to happen soon. Belgium, Portugal and the United Kingdom have started the process. The rules on trust services entered into force on 1 July 2016, allowing these services to flow freely across the EU while enjoying full legal recognition. The part on eID will come into effect as of 29 September 2018. From this date on, any citizen in the European Union will be able to use his or her national eID means, notified according to eIDAS rules, to access online public services in any other Member State. Germany, Italy, Luxembourg and Spain are the Member States which so far have completed their notification procedure. Croatia and Estonia are expected to be the next to officially notify their eIDs. More recently, Belgium, Portugal and the United Kingdom have come forward and initiated the pre-notification procedure. In August 2018, Italy notified the first private sector led eID scheme under eIDAS.